When I was working on my book, my editor asked (more than once) why there wasn’t a marmalade recipe. It was hard to admit to her even though, a few years back, I revealed my deepest preserving secret here. Not only did I not like marmalade, I had never made it successfully. But I felt defeated. Unworthy. As a preserver, I couldn’t live with this failure. So, in January, while traveling through Texas teaching classes for the wonderful Central Market stores. (Three cheers for the fantastic people of Central Market and the welcoming Food52’ers of Austin, Texas!) I taught classes on making the most of the extraordinary fruits available during Central Market’s CITRUS FESTIVAL. Yes, a whole festival of citrus. Four pages of citrus listings! 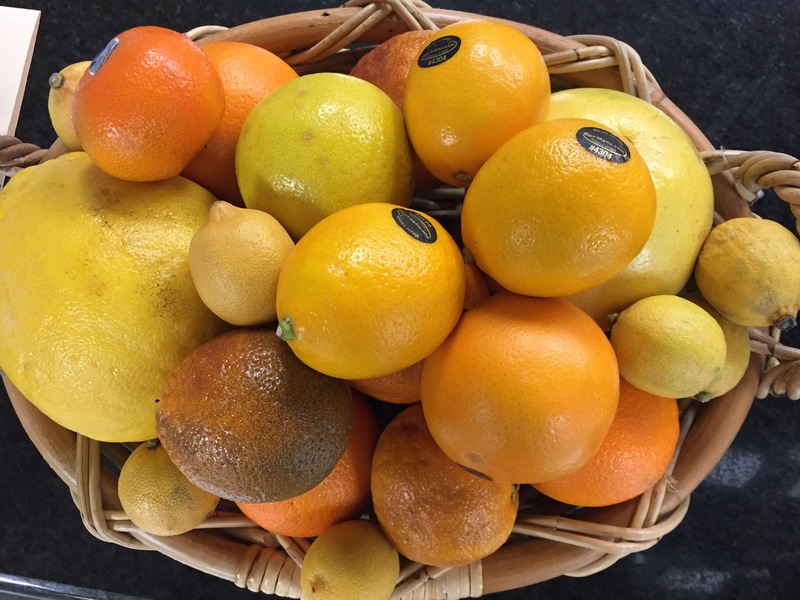 And after shopping in five of the stores, I shipped home three boxes of hard to find fruits: Pink variegated lemons, Sweet Limes, Mandarinquats, Bergamot, Buddha’s Hand, Ponderosa and Sudachi Lemons and Kishu Mandarins. I was going to figure this marmalade thing out and I was armed with some of the most interesting citrus around. I picked up bags of Cara Cara oranges, pink grapefruit and Meyer lemons here at home and set to work. It took three weeks of testing. Make mine mixed fruit. I like the complexity of a mixed fruit marmalade more than the one note of a single citrus jam. As much as I love Meyer lemons, I found the marmalade flat and disappointing. 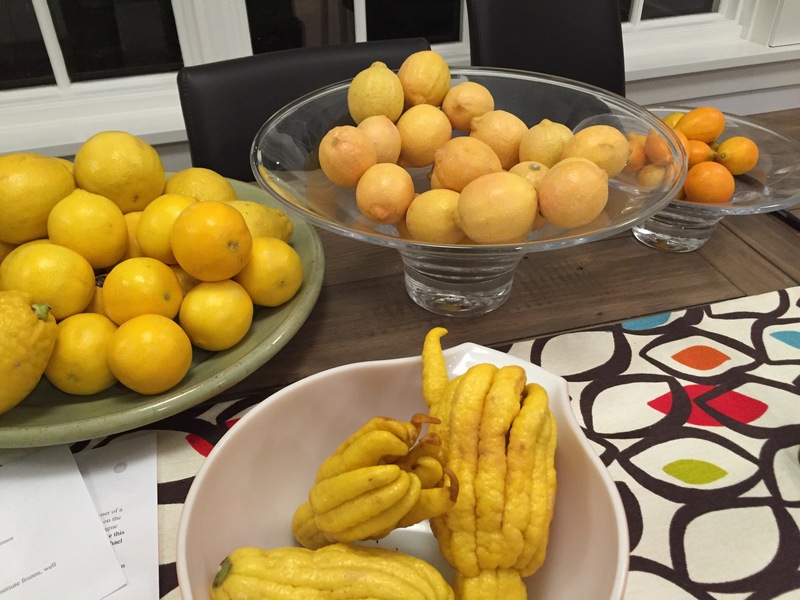 But when I mixed Meyer, Eureka (the usual grocery store lemon), Ponderosa and Sudachi Lemons and Buddha’s Hand there was a symphony of lemon in that jar. For a thoroughly mixed citrus version, I combined pink grapefruit, cara cara oranges, sweet limes, bergamot and pink lemons for a complex and perfumed and simply delightful scone topper. Prepare the fruit thoughtfully. As any preserver knows, preparing the food is 90 percent of the game. Think about how you want to encounter that citrus peel when it’s on your toast. Do you like larger chunks, slim ribbons, or tiny minced pieces? You’ll need to decide and all the fruit must be cut carefully and in identical sizes. Mixed sizes could result in some tender peel and some miserably tough. Too fine and the marmalade will have a gritty texture. Too large and the peel will be more likely to burn. Personally, I prefer slim ribbons. There are only big(ger) batches. Because it takes time to soften the peel sufficiently, small batches are difficult to manage. Every time I tried to work with less than 2 pounds of fruit, there was a problem. Embrace the larger batch (six 8-ounce jars). Balance the bitter with sweet and balance the sweet with heat. 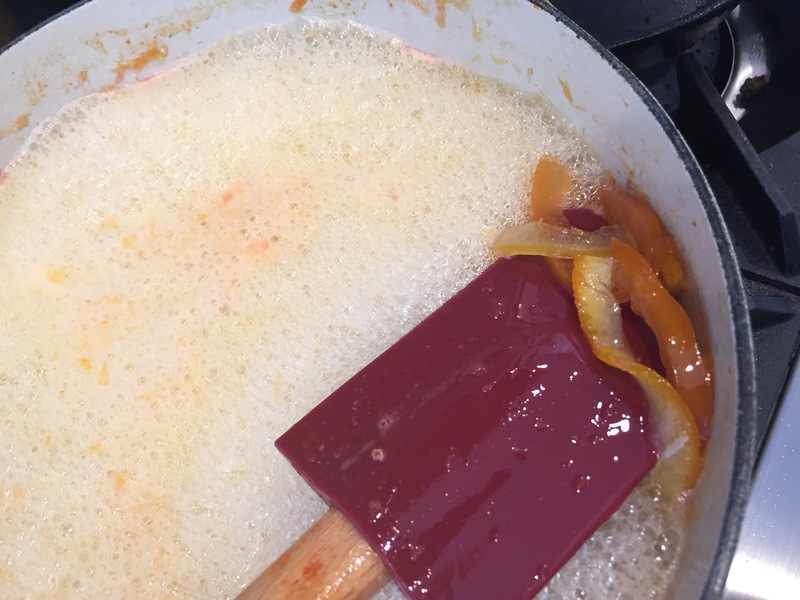 It is not possible to cut the sugar in marmalade and still achieve tender peel and soft set jam. When I stopped burning it and figured out how to cook marmalade, I found it cloying. And when I tried to make it with less sugar, it burned or turned gummy. So I added a chile. It was an easy decision. I had already been making a quick spiced citrus peel, adding a Thai chile. Credit where credit is due: It was on Instagram where I first saw a photo of citrus and chile jam from Confituras, Austin’s brilliant jam maker. And that’s how I came to make Texas Marmalade. The chile doesn’t make the marmalade hot at all. In fact, I couldn’t even tell it was there. Instead, the citrus tasted brighter, clean with the sweet flavor an undertone, and the bitter, tender peel taking center stage. It’s not just for scones. Whenever I mentioned admitted my marmalade disdain, friends would say two words. Cocktail. and Marinade. It’s true. 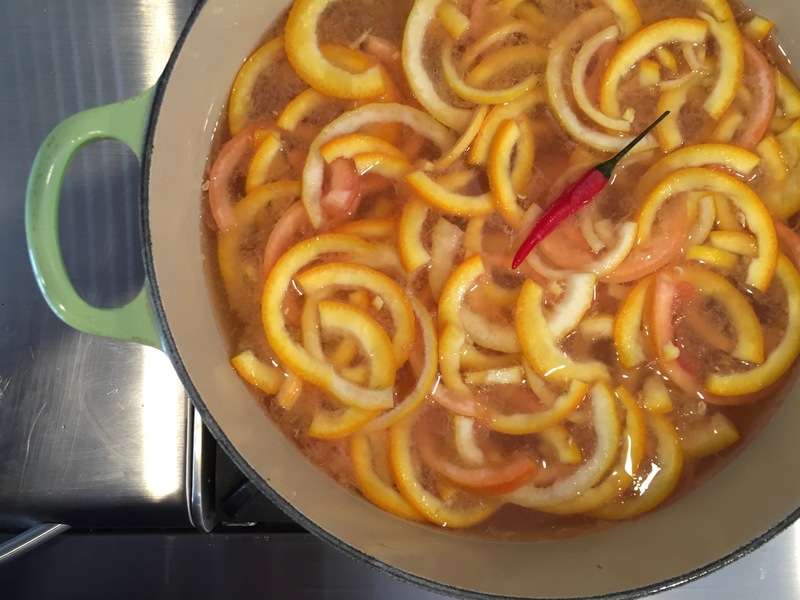 Stir marmalade into gin or prosecco. Brush marmalade on grilling fish. My eyes are open! I’m a believer! Yes, friends, I have conquered marmalade. And so can you. But if marmalade is still your nemesis, I’ve included the recipe for a favorite citrus salad and that quick candied peel, too. Slice the top and bottom off the citrus fruit, then slice in half at the equator. Juice the citrus and measure the accumulated juice. If necessary, add additional orange or lemon juice to achieve at least 2 cups. More juice is better. Remove the pulp from the juiced citrus halves then slice the peel (with pith) into thin slices, about 1/4-inch thick and no more than 1-1/2-inches long. You should have about 4 cups of peel. In a heavy bottomed 5-quart pan, add the sliced peel, fruit juice and 8 cups of water. Place a plate on top of the fruit to keep it submerged and set aside the pot, covered, for 8 to 24 hours. Remove the plate and add the lemon juice and chile. Place the pot over a medium-high heat and bring the peel and liquid to a boil. Reduce the heat and simmer for one hour, uncovered, until reduced by one-half. The peel should be tender. Once at temperature, turn off the heat and move the pot aside. Let it rest for 20 minutes. Stir well. The fruit should be suspended throughout the gel. Ladle the marmalade into jars, clean the rims, place the lids and rings and process in a boiling water bath for 10 minutes. In a jar or small bowl, whisk together the sugar, shallot, garlic, lime juice, fish sauce, serrano, grapeseed oil and salt until emulsified. In a medium bowl, add the peanuts, coconut and supremed grapefruit, then toss with half the dressing, taste and add more dressing as needed. On each plate’s edge, place two of each of the citrus wheels, alternating, then pile the pomelo salad in the center of the plate. Garnish with cilantro leaves and a scattering of candied citrus. Using a channel knife extract at least 12 citrus strips, each about 2-inches. Alternately, peel the fruit and slice into thin strips. Fill a small saucepan with cold water, add the zest and bring to a boil. Drain, reserving the zest and repeat this blanching two more times. The third time, continue to boil until the zest is tender, about 7 minutes more. Drain the zest and set aside. Fill a small saucepan with the sugar and ½ cup water. Clip on a candy thermometer and bring to 220°, add the zest and chile and raise the heat, bringing the syrup to 224°. Remove from the heat and set aside for at least one hour and as long as 24 hours. Rewarm the zest and syrup gently and carefully remove the zest, placing them on a rack over a parchment lined sheet pan. Wrap the zest around a chopstick or wooden spoon handle to create spirals for garnish on the salad. For long term storage, dry on a rack set over a s for 8 to 12 hours, then roll in sugar. 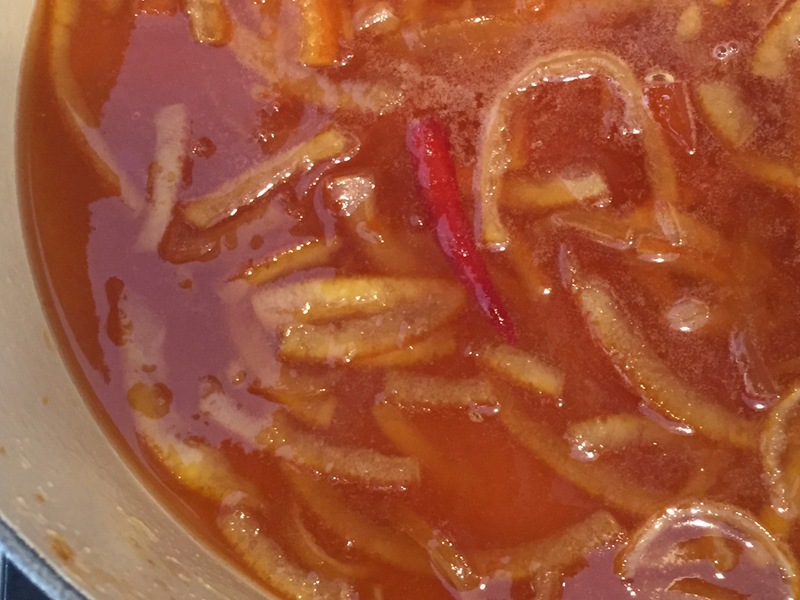 Candied zest may be stored in sugar in a tin or jar and will last indefinitely. 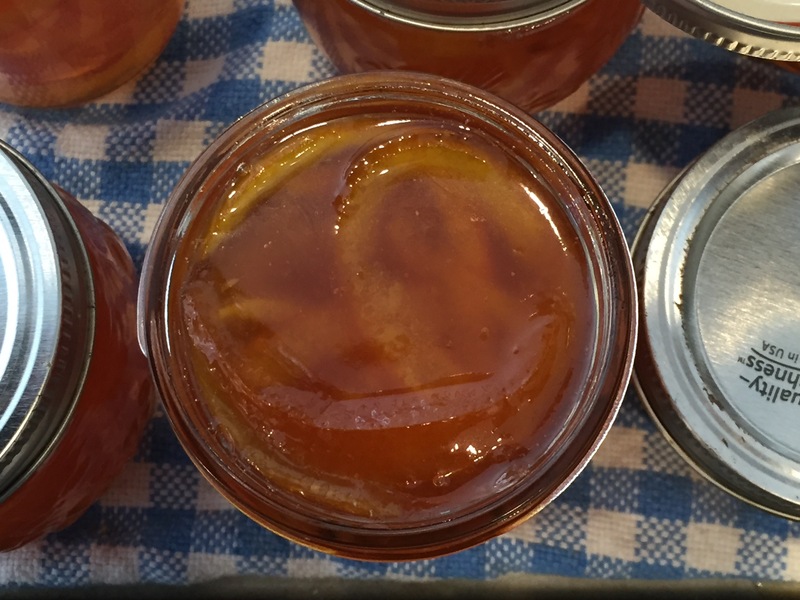 I have only made marmalade a couple of times, and also was not thrilled with the result. But in December, a friend re-gifted me with a Buddha’s hand that she had been given and didn’t know what to do with. I combined it with a few Meyer lemons I had on hand, and made a successful small batch of marmalade–ended up with three half-pint jars. Delicious! Now I know I want to make more. Not so much variety where I now live, though. I feel very lucky to find Meyer lemons here. Hurrah! Three weeks of marmalade testing! No one in my house likes marmalade other than me, so I ended up not making any with my lemons and sticking with your squash and candied peels! What a triumph! Your marmalade looks divine. I’m so glad, from a very selfish perspective, that you stayed in the fight. My previous marmalade attempts have ended in tears, burnt fingers, sticky pots, and lots of profanity. Now, I’m putting marmalade back on my must-try list. Last time I ended up with something that was both too bitter AND absolutely cloying (and I have a huge sweet tooth!). I actually really love commercial marmalade so it’s always been a disappointment that, as a reasonably competent jam-maker, I’ve never been able to make one that’s palatable. Great post, Cathy! I’m working up my courage try it! I live in Austin and I make a delightful Franken-jelly mix of Jalepeno jelly and orange marmalade. I make sure to put a red or orange bell pepper to improve the color because of all the green jalepenos it can end up looking blah. Gina– Like all flowering plants, the Bergamot also has a fruit, a type of citrus. Bergamot is another type of citrus. It looks like a large round lemon and the scent is unmistakable. 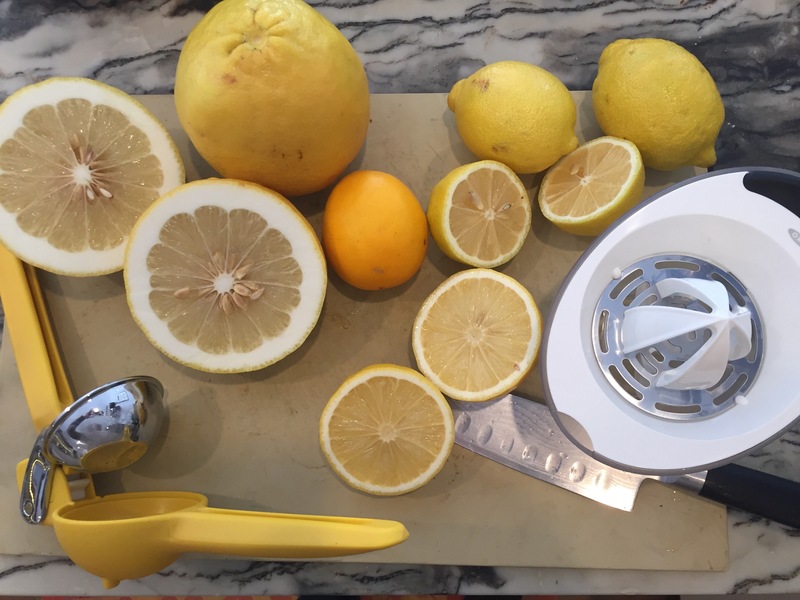 In the second photo, on the large green platter, the bergamot are the round yellow fruits. thanks for the info. I dont think I have ever seen it here in northern Ca. will ask my produce guy about it. What a gorgeous post. It was entertaining to read, and your photographs are beautiful. Thank you. You took me back to the since-closed Incanto in SF’s Noe Valley, which I loved, and where I saw my first Buddha’s hand circa 2002. My mom, a serious Anglophile, always had marmalade in our house. She cut the sugar in her jams and preserves whenever possible. I appreciate flavors not overpowered by sugar. My favorite marmalade is chunky orange peel, as bitter as possible, and not too sweet. I’m intrigued by the idea of marmalade in a cocktail or on fish. Presently, I love it on a piece of wheat toast, or for a rare decadent pleasure, on a scone with clotted cream. I made a Meyer Lemon and Cranberry Marmalade and love it. oh yay! thank you for the post, I was getting ready to make a mixed citrus marmalade (I’m in Texas) but having never made it before was looking at a lot of recipes. None of them mentioned the pitfalls of turning citrus into jam (ha ha, pits). I’m going to use your recipe and tips, thank you thank you!